Important! Update DYMO Label Software to version 8.7.2 if you’re experiencing issues during printing. 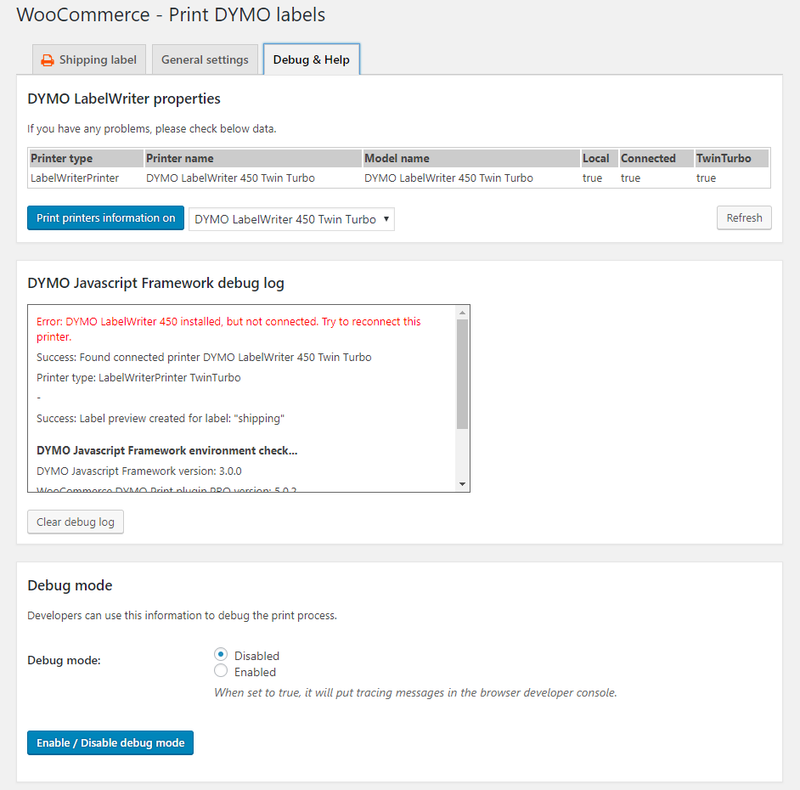 WooCommerce DYMO Print plugin will not work with the new “DYMO Connect” software. 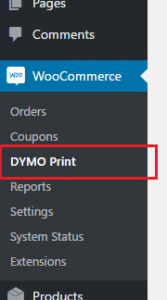 The WooCommerce Dymo Print plugin adds a quick connection with your DYMO LabelWriter within your WooCommerce shop. Now you are able to print labels in a second! Read full description or check the changelog. You need the latest DYMO Label Software to use WooCommerce DYMO Print. Read step-by-step instructions to install the DYMO Label Software. This plugin will not work without DYMO Label Software installed on your computer. Before you start using WooCommerce DYMO Print it’s important to configure the plugin correctly. 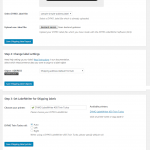 You can find the WooCommerce DYMO Print settings page by click on (or hovering over) “WooCommerce” in the WordPress admin panel and click on “DYMO Print”. 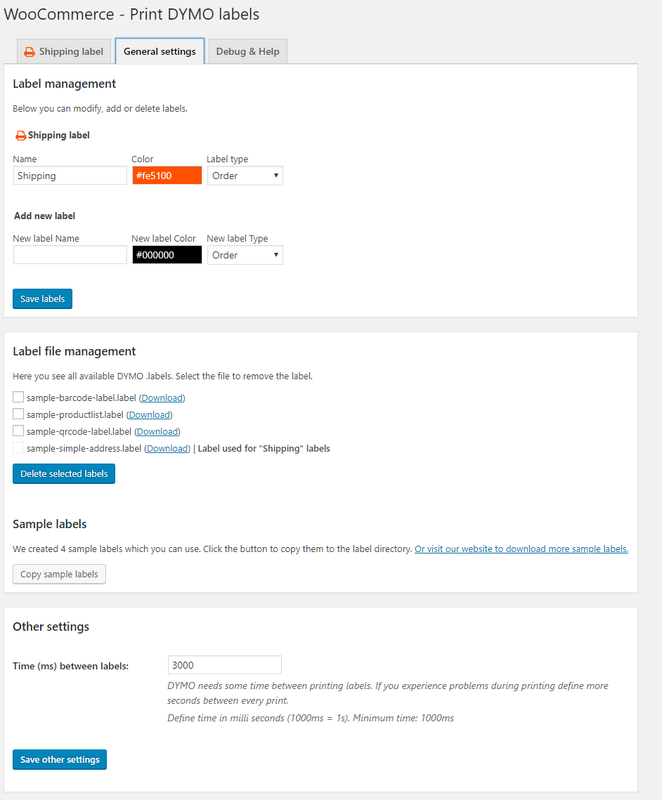 You’ll now see the settings page where you can configure the plugin to your needs. By default you’ll find labels for shipping and billing purposes, but you can add new labels. 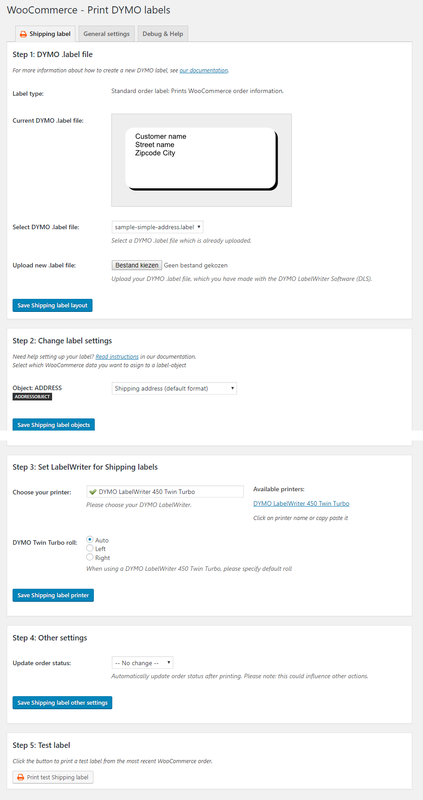 By default WooCommerce DYMO Print has labels for shipping and billing purposes. However you can add new labels to this list. Each label has it’s own layout and configuration. Every label has it’s own configuration on it’s own tab. Click the tab to upload DYMO .label-file, change label-layout and assign WooCommerce data to label-objects. From the “General settings” tab you can add, rename or remove labels, delete label-files and set the time between labels. Debug mode: Enable debug-mode to show debug-information in browser-console. You can create your own labels DYMO Label Software (DLS). For a step-by-step instruction read the following article about creating labels. After creating your label with the DYMO Label Software (DLS) you need to upload it in the plugin. After you have chosen your label, you may configure it. You need to assign WooCommerce data to label-objects (fields). Read more about label configuration in this article. Once you’re all set you can start printing labels from the order overview page and order detail page. Read this article if you need help printing labels. From version 3.0.0. of WooCommerce DYMO Print you can easily copy sample labels from inside the plugin. Go to the debug & help tab for our sample labels. Do you need more? We’ve created some sample labels for you to download. We’ve added some extra options to this plugin which you can add with some simple code snippets. We have made an overview of the most common problems during printing. Check them to debug your installation. If the DYMO Web Service is not running on your system, you can’t print. To use WooCommerce DYMO Print you have to make sure the latest version of the DYMO Label Software (DLS) is installed. From DLS version 8.7.2 (or above) the DYMO Web Service is included in the software. The DYMO Web Service is used for all communication between our plugin and your DYMO LabelWriter. Read more information about how to install and use DYMO Web Service. 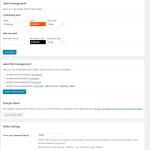 Q: Can I use your plugin for stock management? A: You can print barcodes on labels which you can scan with a barcodescanner of your own stock management system. The plugin does not keep track of your stock or changes stock. Q: Can I change order status after printing? A: Yes, you can automatically update order status after printing. See instructions for more information. Q: I need more different labels. Can I create more labels? A: Yes. By default there are labels for shipping and billing purposes, but you can create as many labels as you need. Read our step-by-step instruction. Q: Is it possible to print order metadata? A: Yes! WooCommerce DYMO Print will read all order metadata from the most recent order. Note: you’ll need at least one order in your shop to read which order metadata is available. See Configurating your label for more information. Q: Is it possible to print a list of all purchased products? A: Yes, select the option Product List and assign it to a label-object . Use tags to create your own product list layout as described in the plugin. See Configurating your label for more information. Q: Can I use all printers? / Is my printer compatible with your plugin? A: WooCommerce DYMO Print is developed to print labels on DYMO LabelWriters. As far as we know all DYMO LabelWriters are compatible. Printers from other brands (for example Zebra or Brother) are not compatible with this plugin. Q: Can I use multiple DYMO LabelWriters? A: Yes you can. You can assign a different LabelWriter for each label. Go to the plugin settings to choose which printer you want to use for each label. Q: Can I also print product labels? A: Yes you can, but you need to purchase and install our WooCommerce DYMO Print Product add-on plugin. Q: Can I print labels for each purchased product (order-item) of an order? A: Yes you can, read instructions how to create and print order-item labels. Q: Can I print multiple labels with a single click? A: Yes. With label combinations you can print multiple labels with a single click. This saves time. You can even print labels on separate LabelWriters. Read instructions how to create label combinations. Q: Why is there no preview of my label? A: If your label contains an image the plugin can not create a preview of it. No image and no preview? Check Debug DYMO Framework for more information. Q: I have installed iThemes Security plugin and can not print. What can I do? A: Depending on your settings iThemes Security may block the local connection with the DYMO Web Service. Read instructions how to solve this issue. Q: Long texts on labels are very small. I can’t read text. What can I do? A: DYMO Label Software does not know any kind of wordwrapping. During label creation you can define if you fit the text to the object or not. Unfortunately we can not wordwrap your texts, because there is no way to define at what point wordwrapping is necessary. For customer messages we made a new function to wordwrap your text and we’re looking to expand this function to other data.